March 2019 Trail Bytes: Who will win the Chili Cook-off? When you think of hearty, one-pot backpacking meals, chili tops the list. I make and dehydrate a pot of Beef & Bean Chili for every trip. Many folks have told me that it is their favorite trail meal. I also hear from backpackers who are looking for vegetarian options. 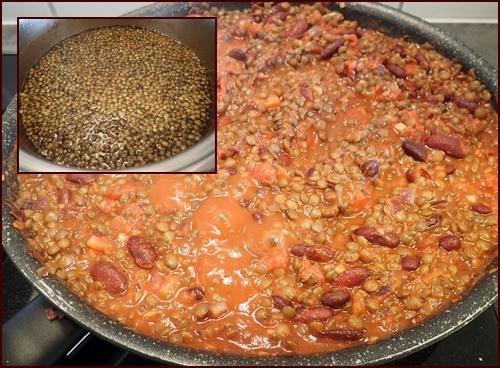 That’s why in this month’s edition of Trail Bytes, I feature a recipe – very similar to the Beef & Bean Chili Recipe – that substitutes green lentils for ground beef. Submit your recipe on this form. This is the information we need: Name of recipe, # servings, brief description, list of ingredients & quantities, instructions to make the recipe, and how to prepare the chili on the trail. Tip: Write the details down in advance, and copy/paste them into the form. Alternatively, you may reply to this newsletter with your recipe written out. At least one photo of your chili is required, but you may submit it separately, as long as you send it by the deadline. Submit your chili recipe by April 28, 2019. All reasonable entries will be included in a special Chili Cook-off feature at BackpackingChef.com. As a “thank you” for submitting your chili recipe, I will send you the PDF version of my trail journal, 1001 Miles on the Appalachian Trail. Voting will take place between May 1st and May 15th. I will cook and present the top two recipes – one with meat, and one vegetarian – in the June newsletter. The winner of each category will receive all three of my other publications: Recipes for Adventure, The Action Guide, and The Menu Planning & Food Drying Workbook. This is going to be fun. Don’t delay. Send me your chili recipe by April 28th. *Green lentils were used for this recipe because they stay firm when cooked. Red lentils tend to get mushy. Rinse lentils first to remove any dust or debris. In a stock pot, bring lentils to a boil in four cups of water or bullion (800 ml) seasoned with bay leaves and ground cumin. Do not add salt yet, as salt on the front end makes lentils tougher. Reduce heat and simmer for thirty minutes. When the lentils are almost done, start cooking the other ingredients in a separate pan. Coat pan with minimal olive oil, and cook onions and garlic for five minutes on medium heat. Add all the dry seasonings and the tomato paste. Continue stirring a few more minutes. Add the cooked lentils, rinsed kidney beans, diced tomatoes, and coffee to the pan. Increase heat until bubbling, and then reduce to a low simmer for thirty minutes. Adjust seasonings to taste during the last five minutes of cooking. Remove chili from stove and stir in the apple cider vinegar. Balsamic vinegar may be used in place of apple cider vinegar. This recipe makes six cups of chili (wet). 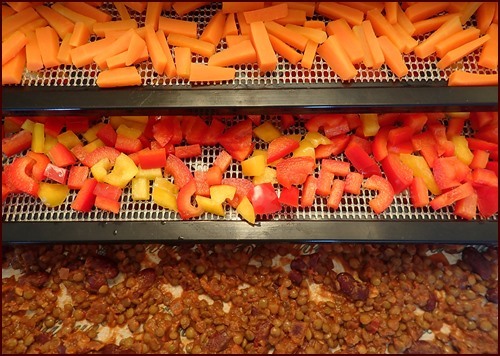 If using an Excalibur Dehydrator, two cups of chili will fit nicely on each of three trays covered with non-stick sheets. Carrots and bell peppers can be cooked in the chili, but they tend to lose color and texture when stewed. That’s why I dry them separately and add them to the meal later. If you steam carrots for 6 – 8 minutes before drying them, they hold their color better than if dried raw. Bell peppers can be dried raw. For this recipe, I dried one tray of carrots, one tray of bell peppers, and three trays of chili, all in one load. 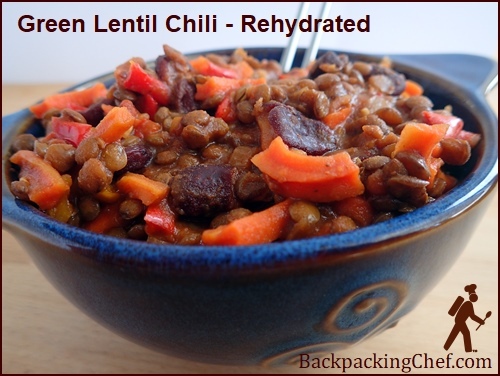 Photo above: 1 serving of dried lentil chili and vegetables. Combine chili and vegetables in pot with water. If you like your chili saucy, add a bit more water. Soak five minutes. Light stove and bring to a boil for one minute. Remove pot from stove and transfer to pot cozy for ten to fifteen minutes. If preparing meal in a thermos food jar, increase water by a quarter-cup. Tasty, as expected. While green lentils don’t have quite the same savory chewiness of beef, they hold their texture well, and they have the ability to absorb any flavors you throw at them. Other vegetables or starches that would work in this recipe are cauliflower, corn, and sweet potatoes. I intentionally kept the recipe basic to leave room for all the creative use of ingredients I hope you send in for the Chili Cook-off. A quick perusal of the internet reveals that people put all sorts of things in their chili: beer, wine, whiskey, cola, soy or tamari sauce, sriracha, dark chocolate or cocoa powder, hot peppers, nutritional yeast, smoked paprika, mango, and cranberries. What’s in your chili? Send your chili recipe by April 28th. Thank you! P.S. If you have any questions or comments about this issue of Trail Bytes, please reply to this email or use this contact form.